The 2014 VMAs' Most Valuable +1. 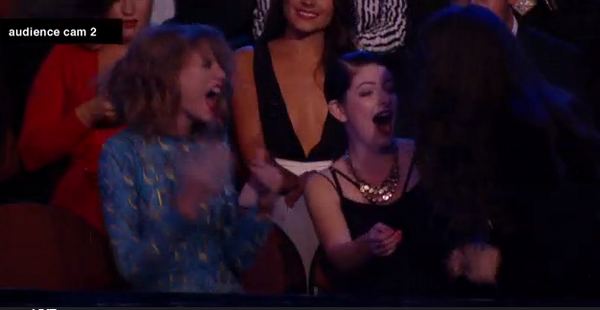 Lorde had a pretty good #VMAs. She wore this jumpsuit and won Best Rock Video. She cursed during her acceptance speech, but whatever. ps. i&#39;m sorry for swearing i was very overwhelmed !!!!!!! ps. i'm sorry for swearing i was very overwhelmed !!!!!!! Still, it's possible that no one had a better night at the VMAs than Lorde's sister, Jerry Yellich-O'Connor. She and Lorde's poet mom, Sonja, were Lorde's dates for the Sunday ceremony in Los Angeles. Taylor meeting Lorde&#39;s sister. A handshake occurred. Taylor meeting Lorde's sister. A handshake occurred. By the end of the show, she had moved off to the side. Jerry is 20 and still lives in New Zealand. Sometimes she travels with Lorde — last year, Women's Wear Daily observed her being super unimpressed by fashion week madness. "About 30 people have packed into the venue’s cramped basement. Among them, a handful of industry types frantically reviewing schedules, a fleet of stylists toting six overflowing rolling racks ('I pulled a lot of vintage Moschino,' one proudly announced. 'Straight from the archives.') and silently tucked away in a small alcove, Yelich-O’Connor’s 19-year-old sister, Jerry. Yelich-O’Connor’s only companion for the trip, her elder sister is equally unfazed, paying more attention to her new iPhone than the madness all around her," WWD wrote. "'IPhones are very expensive in New Zealand,' she explains, before quickly returning her own doll-like eyes to the new toy." And here they are all grown up, getting ready for the Grammys earlier this year.